Plastic mouthpieces feel softer on the lips because they have more “give” to them than metal. This can be very helpful for trumpeters with braces. Plastic mouthpieces feel softer on the lips because they have more “give” to them than metal. This can be very helpful for trumpeters with braces. In fact, if you are using braces I would recommend a plastic mouthpiece over a regular, metal/brass, mouthpiece. Of course there are some negative sides as well. Read about those and more about the benefits, further down, in the end of the article. Of course “the best plastic mouthpiece for trumpet” is a matter of personal preference. However there are a lot of really bad quality plastic mouthpieces that no one should waste their money on so, with that in mind, I made a list of what I consider to be the best plastic mouthpieces for trumpet on the market today. I tried this mouthpiece a couple of years back and even though I’m a guy who is all about building the embouchure, instead of relying on mouthpieces, I have to admit that the Kelly mouthpiece did actually add a couple of notes to my high register. The only reason I did not buy it is because I love my current lead mouthpiece so much. I talk more about that in my article what are the best trumpet mouthpieces for high notes. In my opinion, the “Kelly Screamer” is indeed the best plastic high note mouthpiece on the market today. It is very affordable and many trumpet players swear by it and love it. If you would like to learn more about it you can click here to read real user reviews on Amazon. Most people would not use this mouthpiece for playing lead trumpet in a big band. It can be done, however, and some people actually play lead on a 7C mouthpiece. I tried one a while back and found the sound to be brilliant and clear and I have to admit, it would be kind of cool playing on a chrystal clear plastic mouthpiece. I’m considering ordering one for myself as a backup mouthpiece. Many players say that this mouthpiece seem to increase endurance, which is great. Personally, I did not play it long enough to be able to confirm that though. The 3C cup makes it possible to use as a lead mouthpiece even though it is perhaps more suitable for “regular” playing. Personally I like brass mouthpieces better but that’s not really a “con” as this article is about plastic mouthpieces for trumpet. This is the mouthpiece I would personally choose as my all around trumpet mouthpiece, if I had to play on a plastic mouthpiece. Well, I might perhaps go for the Kelly 7C as I prefer the sound of the Kelly, just a tiny bit more. However the 3C cup makes it great for all kinds of playing, and don’t get me wrong, the sound is not bad at all. This is a great mouthpiece and it is very affordable. It is even cheaper than the Kelly mouthpieces (you can click here to check the price on Amazon) If you want to own a good all around plastic mouthpiece and you like the 3C cup, like I do, then this mouthpiece would be an excellent choice. Let’s take a look at some of the differences between plastic vs. metal trumpet mouthpieces, as this is something that many trumpeters are interested in. Trumpet mouthpieces made of plastic responds better than brass mouthpieces. This means it is easier to get the vibrations going and the tone to “speak”. In other words, it takes less energy input from the player. One benefit of this is that it’s easier to play softly, with delicate, soft and clear attacks. Trumpet mouthpieces made from stainless steel is a bit similar to plastic, when it comes to how the mouthpiece responds, but the steel mouthpieces have a brighter sound than plastic mouthpieces. The plastic mouthpieces sounds darker than both regular brass mouthpieces and mouthpieces made from stainless steel. While it’s easier to get the plastic mouthpieces to “speak” they lack the same, robust, “carrying power” that metal mouthpieces have. In addition to this, mouthpieces made completely out of plastic somewhat lack the “core” in the trumpet sound. Or the density, if you will. The fact that the sound of a heavier mouthpiece, made of brass or stainless steel, will have more core and density than a very light plastic mouthpiece is very logical when we think about it. The heavier metal needs more energy to function but in return it will put out more energy as well and this in form of density and an “energetic core” to the sound. 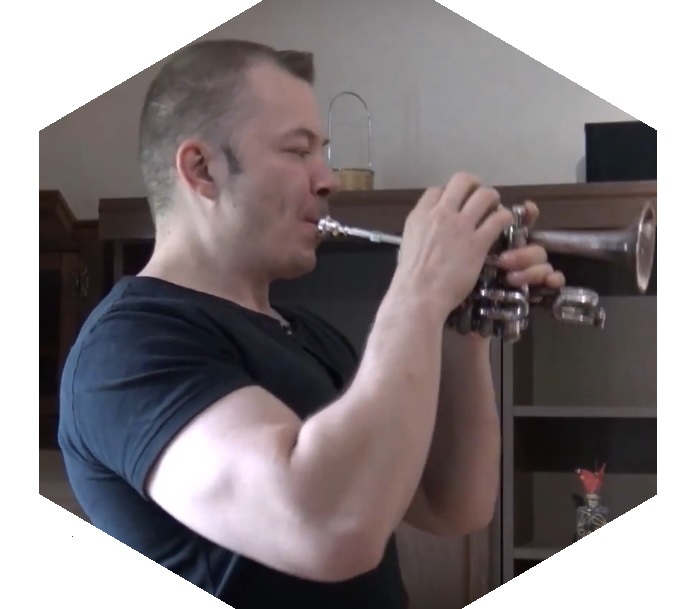 Although trumpet mouthpieces made out of plastic lack some of the core, that metal mouthpieces have, they can be very loud, if the player steps on the gas and wants to play fortissimo. However, since the sound is different, the projection will not be the same as with metal mouthpieces. This means that it can become more difficult for the sound to cut through a bigband, with that brilliant power that lead trumpet players want to have. They can still be used as good high note mouthpieces though but there is a risk that the player will find himself working a bit harder to make the sound cut through. Of course, if the band are using microphones, this will not be an issue. …are you a trumpet player with braces? Well, then using a plastic mouthpiece can be a good choice for you exactly because of that fact. Plastic mouthpieces are easier to “grip” with the lips because metal mouthpieces tend to be more slippery. This will perhaps change the way we approach playing a bit, and for some people it can take some time to get used to. Trumpeters that can get used to this increased grip that the plastic mouthpieces offers because of the less slippery surface, often experience an increase in endurance. This is because the rim is more “locked in”, which means it holds the lips in place in a way that does not really happen with a more “slippery” mouthpiece. Perhaps needless to say, trumpet mouthpieces made of plastic is superior to use outside, in cold weather. This is because they transfer heat less quickly, making them feel warm on the lips. This is not the case with brass mouthpieces and I think everyone who has had to play gigs outside, in the winter time, can attest to this. An interesting fact is that a metal mouthpiece, the same temperature as a plastic one, will always feel colder. The feedback is “faster / quicker” than with metal. This makes the relationship between the player and the horn more intimate. Some people say that it’s easier to change and “manipulate” the sound with the plastic pieces because of that immediate feedback. I learned some of these facts from the skillful mouthpieces maker Dr Dave, who makes the “wedge mouthpieces” in Vancouver. This guy really knows what he is doing and I recommend checking him out. I did a bit of research and asked around a bit to find out what trumpeters using plastic mouthpieces say about them and what they think is good/not so good about them. Trumpet guy #1: I have been using the Kelly 7C for about a year now and I love it. The sound is a bit darker but that is totally fine for me. I like the soft feeling on my lips and something that’s even better is that I have greater endurance with the Kelly compared to my brass mouthpieces. Trumpet guy #3: I use the kelly screamer and I really like it. I don’t know if I last longer on it, than on my other lead pieces, but I really like the feedback and the feeling on my lips. It’s not a magic mouthpiece though, and it won’t suddenly give you an extra octave of range. Trumpet girl: I use the Mutec MTC 3C for my outdoor gigs. I think it’s great because I no longer have to worry about keeping my mouthpiece warm. The sound is also good, so yeah, thumbs up from me. Personally I prefer brass over plastic because I love that special “core” in the sound that my favorite mouthpieces help me produce. We are all unique and have different preferences and at the end of the day, you should be playing the mouthpiece YOU like the most. Keep practicing and remember to have fun while doing it! Previous Previous post: What Trumpet Does Tine Thing Helseth Play? Hi, Robert Slotte here. As a fourth generation trumpet player in my family, I started playing the trumpet when I was 5 years old, and it it safe to say my world pretty much revolves around trumpet playing. I created this site because I want to share what I have learned throughout my years, and it is my sincere hope that you will find some value in it. Playing Trumpet With a Mustache-Does Facial Hair Help or Hurt? What are some good student trumpets? How much does a trumpet cost and how do I find a good student trumpet for a fair price? Robert on Cornet vs. Trumpet – What’s the Difference Between Them? Jerome on Cornet vs. Trumpet – What’s the Difference Between Them?